Marc Myers has published an interesting interview with Chuck Isreals, best know for his collaboration with Bill Evans, at his website JazzWax. 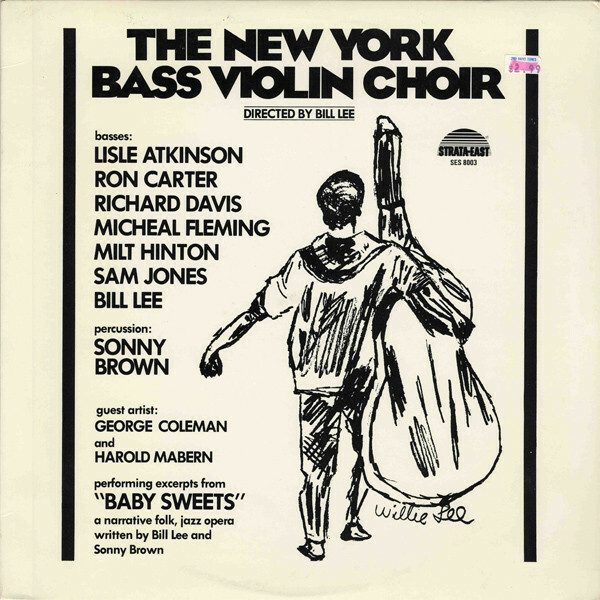 The NewYork Bass Viola Choir was an interesting band led in the late 1960ies by bassist and composer Bill Lee, who by the way is the father of film maker Spike Lee. Rick Jones, founder of Acoustic Image, has introduced a new speaker cabinet: the upshot. Acoustic Image is best known for their concept of downfiring speakers. 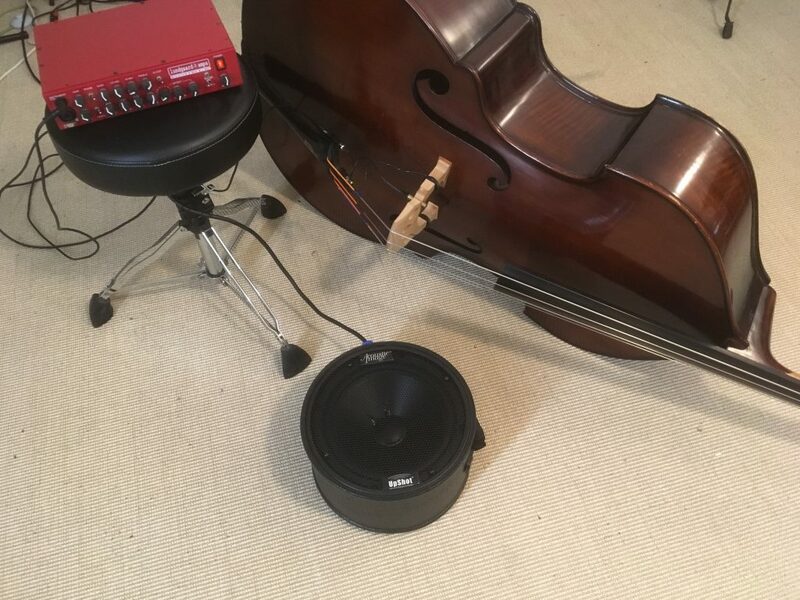 This speaker cabinet is the same idea, but reversed: the speaker is upward firing! I’ve tried this little beast, and what I like best is that it is so small and light. You can even put it in a back pack. But even at this small footprint, the sound is pretty big. And the up firing speaker really helps to hear yourself better. Rob Anzelotti’s new angled endpin design is very easy to use. 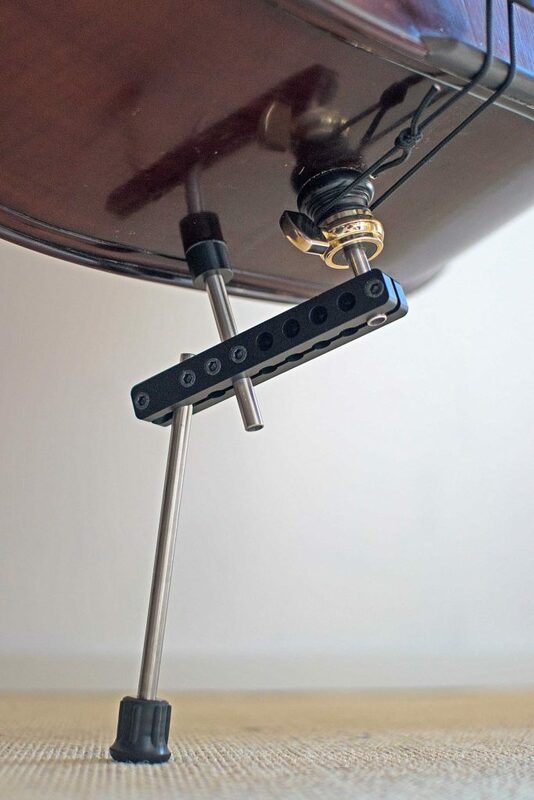 The RobPin’s key feature is the “Bottom Block Rest” which takes on most of the bass’s weight. This eliminates most of the typical stresses on the socket, bottom block, and pin. Use: Once you have it adjusted to your preference, you only slip it in and out of the socket when you are packing and unpacking the bass. When detached, it might even fit into the accessory pocket of your bag! The set screw in your socket needn’t even be especially tight. The weight of the bass goes onto the “Bottom Block Rest”, keeping the bracket from turning. Height and angle adjustment: The RobPin is available with interchangeable rods of different lengths. The angle of the pin going to the floor can be set at 25°, 35°, or 45°. If your endpin is not 10mm, then adapters are available. (If it doesn’t come out of the socket, which is the case for most tube endpins, then you naturally need to remove the holding pin). Soon available at Lando Music / www.kontrabass-atelier.de.